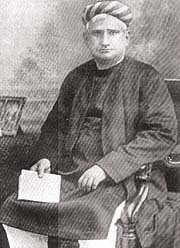 Bankim Chandra Chatterjee also known as Rishi Bankim Chandra Chattopadyay was famous Indian writer and novelist. He is the author of Indian national song "Vande Mataram". He was born on 27 June, 1838 in kanthalpara, North 24 Parganas,West Bengal. He was born in a Bengali Brahmin family. His father was Jadabchandra Chattopadhyay and his mother was durgadevi. His father was a government officer and Deputy collector. He studied at Mohsin college of hooghly. Later he took admission in the presidency college of Calcutta. He also had a degree in law. He started his career as a deputy collector and later became a deputy magistrate. He served as a government officer for about thirty years. 'Rajmohans wife' was his first fiction which was published. His first novel 'Durgeshnondini' was published in 1865. His other novels are - 'kapalkundala' (1866), 'mrinalini' (1869), 'vishbriksha' (1873), 'chandrasekher' (1877), 'rajani' (1877), 'anand math' (1882), 'devi chaudhurani' (1884). Among the novels his most popular novel is anand math. This novel includes the song 'vande mataram'. This novel inspired the freedom fighters to fight for their country. In April 1892 ,he started 'Bangadarshan' a Bengali literary magazine. He was died on 8 April, 1894.